The original Planet of the Apes is an all-time classic. The 2001 remake done by Tim Burton is not. Neither were any of the sequel movies made in the time between the original and the remake. 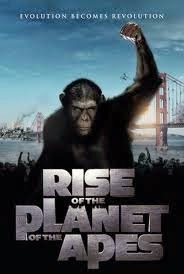 So why the hell would anyone approach the story of the apes yet again? That's what I asked myself back in 2011 when the powers that be decided to do yet another reboot/remake. That's what I asked myself as I bought the film on blu-ray at Target a couple of days ago, too. I suppose all of the hoopla over Dawn of the Planet of the Apes convinced me to get started on what appears to be a new Apes series. I was pleasantly surprised. I haven't seen the newer one so I'm not going to make any comparisons there, but so far this is easily the best film under the franchise name since the original. I mean, it is not really contest at all because all you have to do is just look at the competition, but had there even been a marginally decent sequel to compare this film to than this one would win by a landslide. A lot of praise has been given to Andy Serkis and I wasn't quite sure why when I first approached this movie. Then I read up on him and discovered that he was also the guy who played Gollum (I actually knew he played Gollum but I forgot I knew) and King Kong. I also read about just how much work goes into the performance-catching and whatnot. I have some newfound respect for the man named Andy Serkis now. He totally made Rise of the Planet of the Apes as engrossing as it was. John Lithgow and James Franco were pretty good too, but Andy Serkis hands down made this movie amazing despite all of the technological stuff that seems to cause more harm than good in Hollywood these days. He should have won some kind of Oscar. I know part of it was computer stuff, but so were his performances in The Lord of the Rings and King Kong. In all cases the end result was pretty damn impressive, but not just because of the computers. Those were his voices and his facial expressions and his movements for the most part. He's just mind-bogglingly good. I haven't seen any of his live action roles, but I probably should, though. It's just amazing what the guy can do. I have got to see Dawn of the Planet of the Apes now. This one is definitely a winner. I do have a soft spot for the 70s sequels. They don't compare to the original but I like them. I think the main reason I like them is that they came out when I was 10-12 years old and my friends and I went to see them all over and over again. We were Planet of the Apes crazy. (We used to say, "get your hands off me you damned dirty ape" to each other quite often XD) I recently bought the blu-ray 5 pack but haven't watched it yet. I did watch the sequels a few years back on dvd and enjoyed them but the quality wasn't the best so I'm hoping they have fixed that with the blu-rays. For some reason, I always seem to like what I liked when I was a kid. I guess it's kind of sentimental. I saw "Rise" a couple years back and liked it. I had a little bit of a beef with James Franco in this. He seemed kind of disconnected. I like James Franco and he has some very good roles but he can really phone some in too. I haven't seen "Dawn" but I understand it is very good so it's on my list too. As for Tim Burton's version ECCH. Tim Burton seems to be a one-trick pony and I grew tired of the one trick long ago. I am not too familiar with James Franco. I know his name, but I couldn't place him in any movies other than Spider-Man. I didn't really pay much attention to him. I don't think the movie did either. He seemed like he was just there to fulfill a role. I like Tim Burton's early movies, but I don't think he is a genius or anything. I'm also not the largest Johnny Depp fan in the world and those two seem to be joined at the hip. I want to get the five blu-ray movie pack of the Apes because I am a completist that way. I also liked Roddy McDowall in those movies. I remember watching them one of those times they were on AMC and they weren't bad. Although I'm surprised they reduced Heston's role to a cameo in Beneath the Planet of the Apes. Still, those movies were better than the remake by a mile.